Our oxygen gas generators work with PSA (Pressure Swing Adsorption) technology. Using this technology, we produce oxygen gas generators that are low on maintenance, and highly economical while they produce the desired results in a hassle-free manner. 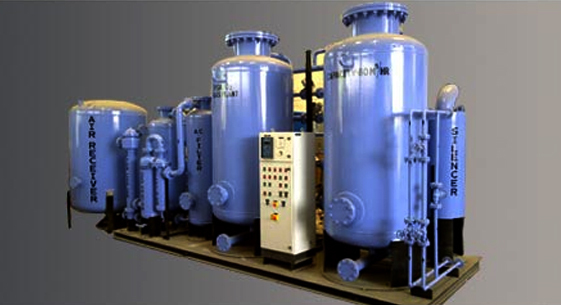 These generators absorb nitrogen with the help of two absorption vessels filled with zeolite molecular sieves responsible for nitrogen absorption. Air is taken from an air compressor and oxygen is separated form other gases, including nitrogen with the help of special grade of zeolite molecular sieves. The process involves two towers filled with zeolite molecular sieves which adsorb nitrogen and subsequently discharge waste. In Gas Generation Process the oxygen generated is 85-94% pure. When nitrogen saturates from one tower, this process changes over to the other tower, thus helping in the process of continuous oxygen generation. Full Automation : All systems are designed for un-attended operation and automatic Oxygen demand adjustment. Lower Space Requirement : The design and Instrumentation makes the plant size very compact, assembly on skids, prefabricated and supplied from factory. Fast Start-up : Start-up time is only 5 minutes to get desired Oxygen purity. So these units can be switched ON & OFF as per Oxygen demand changes. High Reliability : Very reliable for continuous and steady operation with constant Oxygen purity. Plant availability time is better than 99% always. On site supplying oxygen by piping net for human breath for as the hospital oxygen center. 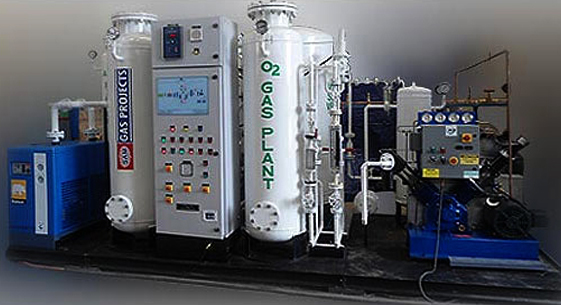 Oxygen Gas Plant for Industrial & Medical Plant are available with oxygen cylinder filling system.